Handbook of Crystal Growth, 2nd Edition Volume IIA (Basic Technologies) presents basic growth technologies and modern crystal cutting methods. Particularly, the methodical fundamentals and development of technology in the field of bulk crystallization on both industrial and research scales are explored. After an introductory chapter on the formation of minerals, ruling historically the basic crystal formation parameters, advanced basic technologies from melt, solution, and vapour being applied for research and production of the today most important materials, like silicon, semiconductor compounds and oxides are presented in detail. The interdisciplinary and general importance of crystal growth for human live are illustrated. 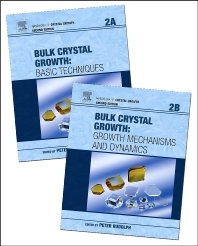 Handbook of Crystal Growth, 2nd Edition Volume IIB (Growth Mechanisms and Dynamics) deals with characteristic mechanisms and dynamics accompanying each bulk crystal growth method discussed in Volume IIA. Before the atoms or molecules pass over from a position in the fluid medium (gas, melt or solution) to their place in the crystalline face they must be transported in the fluid over macroscopic distances by diffusion, buoyancy-driven convection, surface-tension-driven convection, and forced convection (rotation, acceleration, vibration, magnetic mixing). Further, the heat of fusion and the part carried by the species on their way to the crystal by conductive and convective transport must be dissipated in the solid phase by well-organized thermal conduction and radiation to maintain a stable propagating interface. Additionally, segregation and capillary phenomena play a decisional role for chemical composition and crystal shaping, respectively. Today, the increase of high-quality crystal yield, its size enlargement and reproducibility are imperative conditions to match the strong economy. Scientists and engineers from diverse (academic/industrial) backgrounds including crystal growers, physicists, chemists, engineers, bioengineers, solid state scientists, materials scientists, earth scientists, etc.